Should Greenport ZBA members be allowed to participate via Skype? 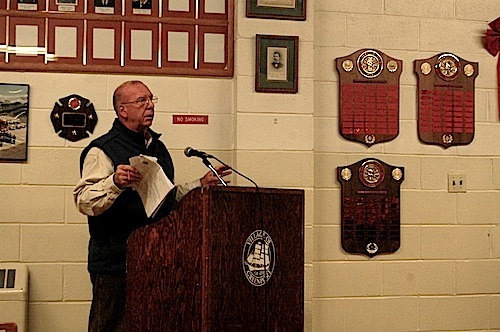 CYNDI MURRAY PHOTO | Greenport resident John Saladino voices concern about the new alternate positions during the Village Board’s regular meeting Monday night. The Village Board has created two alternate positions within the planning board and zoning board of appeals. During the Village Board’s regular meeting Monday night, Mayor David Nyce said the four alternates are expected to vote on applications only if a regular member decides to recuse himself or herself for having a personal or business relationship with an applicant. Prior to the Village Board passing a resolution to create the alternate positions, ZBA member David Corwin said he disagreed with the decision and questioned the need for extra board members. Mr. Nyce said the new positions were created after the chairs of both the planning and ZBA boards expressed concerns that some board members have a conflict of interest with pending application hearings. He did not say which applications are expected to have conflicts with board members. Despite the reasoning to appoint alternates, Mr. Nyce cast the lone dissenting vote.